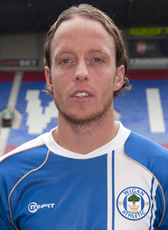 Breda born Ronnie Stam joined Wigan Athletic from league champions FC Twente for a fee of £3.3m. He officially joined the English club on the 30th of July 2010 signing a 3 year contract. In his third season, he relegated with his club to the Championship. His expiring contract in June 2013 was not extended and Stam was released on a free transfer looking for new opportunities. At the end of July 2013, Stam moved to Belgium to sign a 3-year contract at Standard Liège. In July 2015 he was released from his contract and joined his former club NAC Breda on a 3-year deal. In June 2016 Ronnie Stam decided to terminate his contract and to retire from professional football. In his final season he was one of the best players of the selection, but because of his physical state he decided not to continue the two lasting contract seasons on professional level.